Group size is six participants plus two guides. This advanced expedition is suitable for experienced kayakers only. The Outer Coast Expedition is designed for experienced kayakers who are familiar with our style of travel. Outer Coast Expedition participants will have joined Gord on a previous tour, course or expedition. The 2019 Outer Coast Expedition is essentially an extended Cape Freeman Expedition. This journey is specifically suited to those who are seeking a longer trip, while paddling and camping on the outer coast of Haida Gwaii. Returning participants who are seeking an even longer Haida Gwaii experience may receive a CAD $1000 discount by combining the August 10th Cape Freeman Expedition with the Outer Coast Expedition. This discount requires full payment at the time of booking. Traversing the exposed outer coast of Haida Gwaii by single kayak is an entirely humbling experience. Weather and sea state are constant considerations during this advanced expedition. The itinerary remains completely adaptable; we paddle when conditions permit and remain on shore when awaiting the next "window of opportunity." 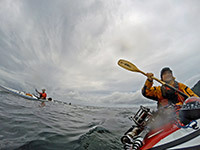 Paddlers on this expedition can expect to spend several days on shore, waiting for conditions to become stable enough for the next open coast traverse. Each expedition member must maintain an attitude of maximum flexibility in order to adapt to this challenging environment. The trip begins on August 17, 2019 in Sandspit, British Columbia. Participants are picked up in the morning at Seaport B&B (or another Sandspit accommodation of your choice) for the one-hour van ride to Moresby Camp. Here, you board a large Zodiac-style speedboat for transport to Rose Harbour. We launch from Rose Harbour to begin our journey. We intend to paddle up the west side of Moresby Island to camp on the exposed island of Hlgwaii, as well as explore the intricate rocky surge channels of Cape Freeman. 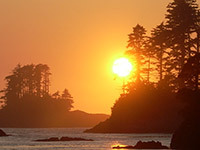 Our expedition also intends to visit the ancient Haida village of SGang Gwaay. We enoy well over a week of wilderness camaraderie while we camp and explore this remote, exposed region of the outer coast. On the second-to-last day, we return to Rose Harbour to enjoy dinner hosted by the local residents. Our last night is spent in Götz's guesthouse. On August 27, the speedboat arrives in Rose Harbour to transport the group to Sandspit. At the end of the day, you are returned to Seaport B&B, or another Sandspit accommodation of your choice. The route and itinerary remain very flexible to accommodate changeable west coast conditions. Alternate boat or floatplane transport may be substituted. In order to confirm the Outer Coast Expedition, two people must register in advance.